At the project’s heart is the quality of life of local residents in districts and buildings as well as the interaction with innovative and easy-to-implement adaptation options for building (re)construction as well as optimization of the capacities of urban open spaces (see figure). In its trans- and interdisciplinary approach with the focus on the perceptions of local citizens, the project is devised as a living lab. 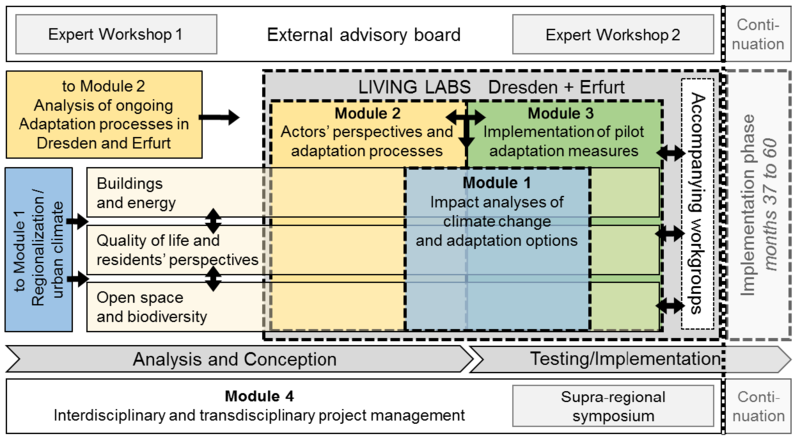 Such a living lab approach integrates (a) close exchange with practice partners (state capitals of Dresden and Erfurt as well as other local partners) and scientific partners as well as (b) concrete application of scientific and other technical expertise in matters affecting civic society at district level, e.g. by simulating the impact of various forms of climate adaptation for testing by local residents, interactive exhibitions and dialogue-oriented presentations. The living lab approach serves to disseminate expert knowledge amongst local residents and relevant actors. The perspectives of local residents are incorporated by means of participatory events in science and practice in order to jointly develop, discuss and prioritize pilot measures with all relevant actors. In this way the living lab constitutes a marketplace of ideas and exchange between various scientific disciplines, decision-makers (primarily within municipal authorities and from the building sector) as well as members of civil society, with the aim of enabling generally agreed forms of action that anticipate future conditions and needs. The project "HeatResilientCity" is funded by the German Federal Ministry of Education and Research (BMBF).